Liquid bone, the texture of toothpaste and cancer diagnosis at the speed of light. These are just some of the gadgets that UK scientists are working on to revolutionize medical treatment. Invented by surgeons at London's Royal Free Hospital, this optical device allows doctors to discover immediately whether their patient's cancer has spread from the breast to the lymph nodes. After doctors have identified the lymph gland, they remove it from the patient, carry out a biopsy on the gland and then cut it into two. An optical scanner will check the whole surface of the lymph gland. The signal it gives out when it finds cancer is different to the signal from non-cancerous glands. The red part on the computer screen indicates cancer. The procedure not only eliminates the need for more pathological tests, but allows surgeons to remove cancer cells right away. 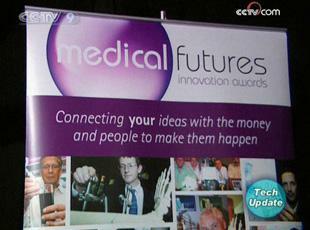 Another big winner at the Medical Futures Awards on Tuesday was a polymer-based liquid bone invention from a team based at the University of Nottingham. It starts as the same texture as toothpaste, but when it's injected into a person, the body's temperature hardens it, giving it similar features to normal bone. Once surgeons have injected the material, new bone tissue and stem cells will migrate to that site. Over a six-month period the polymer will gradually break down as it's replaced by regenerated bone tissue. The inventors of these and other innovations all hope their new techniques will take off around the world, earning them millions of dollars in funding along the way.